Tuna, Caper, Olive Mini Frittata, Thyme for Cooking easy gourmet starter. 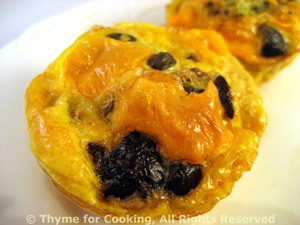 These Frittatas look like cupcakes but are actually fluffy eggs, mixed with small bits of anything savor. They can be served, hot, warm or cold and are great to do ahead for a party or, in summer, a picnic. Divide the tuna, capers, olives and cheese evenly between the cups. Using a ladle or spoon divide mixture evenly between the cups. Bake at 400F (200C) for 12 - 15 minutes or until set. Frittatas will puff up considerably and then fall when removed from oven. Allow to cool 5 - 10 minutes before removing from pan; they will start to come away from the sides of the pan as they fall making them easier to get out. Serve with a garnish of olives or sliced cherry tomatoes, warm or at room temperature.